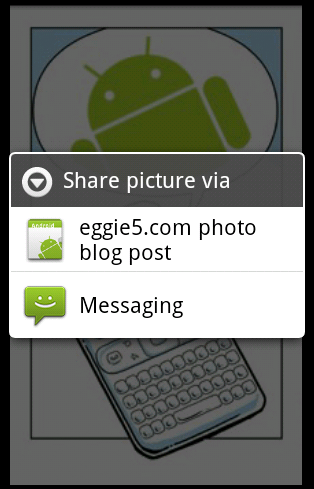 You know in the android gallery when you view a picture there is the share menu that allows you to upload your picture to various services. It is the job of the app to handle the upload - for example on my phone (depending on the apps you have installed) facebook, picasa, blogger all have entries in that list. This article will describe the process to get your app in that list and post the picture over HTTP. 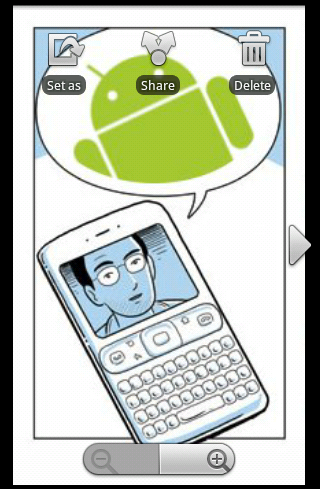 If you intend to get your app in the share menu you must register that intent (pun intended) w/ the andoid system. This is done via and intent-filter in the AndroidManifest.xml file. First we get a path to the image (uri) from the share menu of the gallery when we clicked on share. It's not however just a path to the image - it's a content uri which is android platform specific way to refrence a resource. It looks somehting like this content://com.example.gallery/3. With a URI you can then query gallery for the resource. The key here is getContentResolver() method - it will get you a handle to android internal DRM system which the cameria/gallery exposes(uses). Then in order to sent the image over HTTP we must convert it to plaintext encoding (base64) from binary. We do this by gettings it's bits and converting to base64 string representation (details are beyond the scope of this article - see source for details). Rather than choose a high level library for the HTTP action I chose to implement it using sockets as an exercise (more fun - we can really see what's happening). First we build the xml post body string. We then create the request and send it. Note: most people would do this using multipart/mime but I choose just to encode the image into the xml photo node. String xmldata = "<?xml version=\"1.0\" encoding=\"UTF-8\"?>"
When the image is uploading the UI kinda locks up - the next step would be to have some type of progress bar like the facebook or picasa app does. Also usually the images are way to big for the front page of this site (where they go) - should implement some type of resize on the phone. This would also make the upload faster.